Philadelphia Federal Criminal Defense Lawyers - Oberheiden, P.C. Oberheiden, P.C. is a federal law defense law firm providing its client services across the nation. With a team of experienced criminal defense attorneys and former federal prosecutors, our attorneys have collectivelly handled thousands of federal cases. We take a strategic and aggressive approach that is designed to secure a favorable resolution for our clients as quickly as possible, and we rely on decades of experience inside of the U.S. Department of Justice (DOJ) to combat the government’s accusations. Are You Under Investigation or Facing Charges? If you have been contacted by federal agents, if you have received a target letter or grand jury subpoena, or if you are concerned that some sequence of events may have made you a target for federal investigation – you need experienced legal representation from our dedicated Philadelphia federal criminal defense lawyers. Federal criminal investigations can move quickly; and once you find out that you are a target, investigators and prosecutors will have likely already formed an opinion about your guilt for the crime (or crimes) alleged. 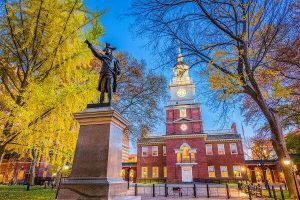 If you have been arrested in Philadelphia, or anywhere in Pennsylvania, it is imperative that you speak with a federal law criminal defense attorney as soon as possible. You need to be prepared for the process to come, and you need to make sure you avoid mistakes that could jeopardize your defense. Most federal crimes carry severe penalties, and you could be facing insurmountable financial liability in addition to years, if not decades, of federal incarceration. Federal authorities are aggressively pursuing a broad range of criminal investigations in the Philadelphia area. Raids, arrests, and indictments are all routine occurrences, with everyone from alleged drug dealers to corporate health care CEOs facing the risk of prosecution. Our attorneys will work hard to protect you, but you need to act fast. To get started with a free and confidential case assessment, contact us today. The federal criminal defense team at Oberheiden, P.C. represents business executives, business owners, public officials, physicians, lawyers, accused drug dealers, and other clients in complex federal matters. We have extensive experience representing clients during investigations and in pre-trial plea deal negotiations. We have represented more than 500 clients in federal criminal court. Whether you are under investigation, under indictment, or awaiting trial, we have the experience and skills to adress the facts of your case and you can rest assured that we will do everything in our power to obtain the best possible result as quickly as we can. Unlike other firms, we do not expect our clients to put their trust in junior lawyers or associates when their freedom is on the line. Each client of Oberheiden, P.C. is represented by a team of senior attorneys who all have significant experience in federal criminal matters. In a federal investigation, early intervention is critical. If you contact us while your investigation is pending, our attorneys can make contact with the prosecutors assigned to your case to discern the scope and nature of the allegations against you. Then our strategy generally includes challenging the government’s assumptions, legal interpretations, and investigatory procedures. Once we gain a firm understanding of the theory of the government’s case, we can then begin outlining all of the factual and legal defenses you have available. This includes not only challenging the government’s evidence (remember, in order to obtain a conviction, the government must prove its case beyond a reasonable doubt), but also raising any affirmative defenses or safe harbors that may insulate you from prosecution. If you have been detained, we will work vigorously to secure bond as quickly as possible. While federal bond matters involve unique and challenging processes and procedures, we have close to a 100% success rate securing bond in federal criminal cases. If it is not possible to resolve your case before charges are filed, we will continue to maintain contact with the prosecutor’s office in order to work toward a favorable pre-trial resolution. Government attorneys do not want to go to trial if they do not have a case, and we will aggressively assert all available defenses in order to effectuate the goal of persuading the attorneys working on your case that further prosecution is unwarranted. Finally, if your best option is to fight for justice at trial, we will meticulously prepare to present a comprehensive defense in court. With experience in hundreds of bench and jury trials, we have experience in what it takes to raise doubt about the government’s case, and we will work vigorously to protect you against the consequences of a conviction. Why Do Clients in Philadelphia Choose Oberheiden, P.C. for Federal Defense? With numerous local and national firms offering federal criminal defense representation in Philadelphia, why will local clients choose Oberheiden, P.C.? Federal Experience – We have decades of experience representing clients at all stages of federal criminal cases. Many of our attorneys are former federal prosecutors who used to fight for convictions on behalf of the DOJ. Federal Results – Our goal is to consistently secure favorable results in federal investigations, indictment proceedings, plea deal negotiations, and at trial. When clients contact us during their investigations, our goal is to resolve their cases without charges being filed. To speak with our federal defense team about your criminal case in Philadelphia, please call (888) 519-4897 or contact us online to schedule your free and confidential case assessment. You can reach us seven days a week, and we will make arrangements for you to meet with our team as soon as possible.